Saturday November 11th witnessed a massive turn-out in Sara Stadium, Festac and Trade Fair Complex at Ojo Alaba as Yudala made it a weekend to remember for scores of enthusiastic shoppers who took advantage of the amazing deals in its Mega Black Friday promotion tagged 11/11-12/12. Determined to ensure that the unreached and under-served members of the public get a chance to enjoy the 11/11-12/12 Mega Black Friday deals, Yudala had stormed both locations by 9am with truck-loads of genuine products from various categories including Home Appliances, Computing, Electronics, Mobile phones, Lifestyle/Consumer Goods, Power Solutions, Food, Wines/Spirits, among others. 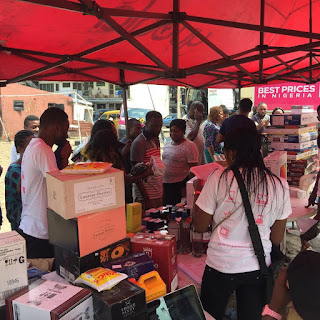 It turned out to be an opportunity of a lifetime for thousands of residents in Festac, Satellite Town, Amuwo-Odofin, Agboju, Alakija, Ojo Alaba and environs to shop genuine products at best prices unmatched in the marketplace. For Mrs. Toyin Moroundiya, a lecturer at the Lagos State University, it was a dream come true. “In fact, I didn’t believe it at first when I heard about it. I just rushed over and actually it is real. The TV set I had in mind to buy was available here and it’s actually half the price. This is awesome. I think everybody should take advantage of it. Yudala is real,” she gushed. Another shopper, Arinze Obi, could not hide his excitement after grabbing a number of bargain deals on various items. He urged other shoppers to follow his footsteps in shopping wisely this season. “My fellow Nigerians, what I will say to you is: get yourself prepared. Go to Yudala and get whatever you need for yourself at very affordable prices,” he concluded. Also speaking after experiencing the Yudala 11/11-12/12 Offline Mega Black Friday train, Mrs. Philomena Mbah was effusive in her praises and prayers for Yudala. Next Saturday November 18th 2017, it will be the turn of Agege and Ita Ilewa, Ikorodu to enjoy the Yudala 11/11-12/12 deals galore, with plans already finalized to storm both locations with a mobile store, two 40-feet trucks and buses loaded with eye-catching products and accompanied by dancers, music and digital entertainment. The Yudala 11/11-12/12 Mega Black Friday which kicked off on Saturday November 11th will run until Tuesday December 12th 2017 online @ www.yudala.com and in every Yudala store nationwide.